Today in History–March 24–the Library of Congress features a letter George Washington wrote to the Continental Congress on this date in 1776, one week after British troops evacuated Boston but remained nearby. 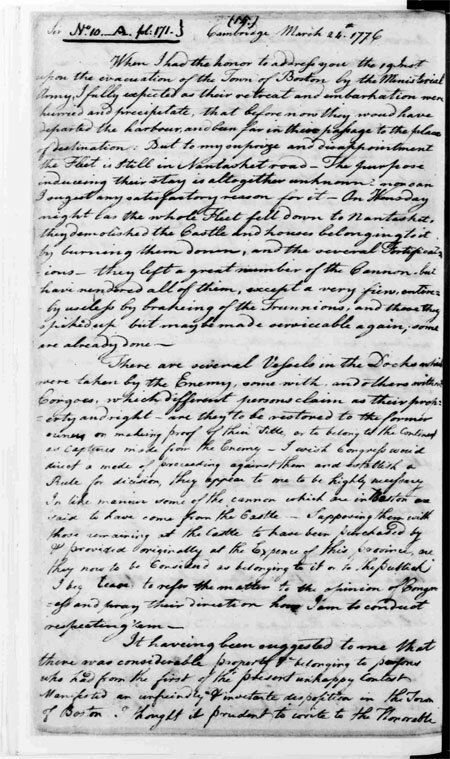 In the letter General Washington expressed his surprise and disappointment at the situation and went on to describe the exploits of the British in the area. During the Revolution, Washington maintained frequent correspondence with Congress. Learn more by visiting the Today in History section, then follow the links below to learn more from the words and deeds of the United States’ founding fathers.